A printer that covers every need at an unbeatable price! New compact, with open source filament system, 3D printer from XYZprinting. The C2 is a smart, compact 3D printer with wifi connectivity that gives you the freedom to print what you can imagine by remote manipulation from your mobile device. Payment by Card, PayPal, Cash on Delivery and payment at the store. The C2 is a smart, compact 3D printer with wifi connectivity that gives you the freedom to print what you can imagine by remote manipulation from your mobile device (Android & Apple). With the free Robo app you can experience new features in 3D printing and get the most out of your printer. You can connect through your mobile device to the printer, track the progress of printing, and manage multiple prints and printers at the same time in detail and precision. With the 3.5 "color touch screen, the printer is easy to use and quickly accessible for direct printer setup, and the print area is 127 x 127 x 152.4 mm large enough for the size of the printer to be too small. Robo C2 is built to get everywhere from home to your workplace with a modern design that will suit every environment. Prints 20+ types of materials that do not require a heated print surface. The Robo C2 achieves very fast printing speeds and has, in addition to automatic adjustment of the print surface and filament correction sensor that detects if it ends or cuts its flow for some reason and does the necessary procedures. With these extra settings and many more, the Robo C2 is the smartest printer. The P120 is concentrated on the daily use and not something you have to struggle with just to make it print. It should be fun and easy to print! The Anet A3 is here to offer a complete 3D printer at an affordable price. Faster, sturdier, more, all-around, perfect! Creality CR-10 Mini is a smaller version of the popular CR-10 series! The printer have a sturdy all-metal frame and a heated bed. Creality CR-10-S5 – 50x50x50 cm is a super large build area 3D printer. Creality is known for its highly reliable and very solid 3D printers. If you need to 3D print parts with a large edge length this large building space 3D printer is perfect. It comes open source. Choose with slicer and filament you want to use. Manufacture huge parts now! The Creality CR-10S - 30x30x40cm is a large build size and easy to operate 3D printer. It offers an nice 3D printing quality at a low price. 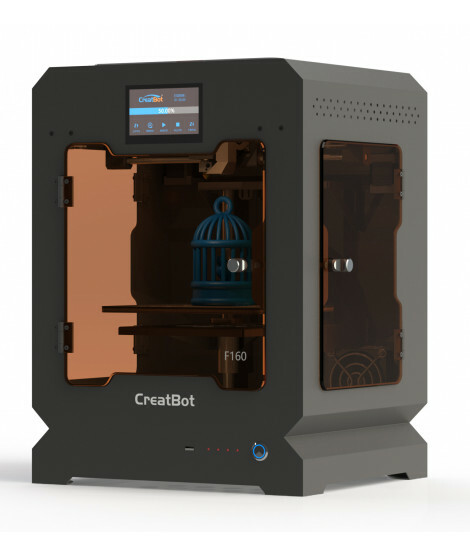 High resolution and with a large printing surface, you can't miss with the CreatBot DE PLUS! Size matters! This solid constructed 3D Printer has dual print heads, semi enclosed chamber with see through walls, a heated glass print bed and a Bowden style extruder. Getting started in 3D printing with Finder is much easier and more affordable than ever. FlashForge Inventor is ready to create high-quality prints thanks to a fully closed, temperature controlled construction chamber. In addition, there is no limit to the designs to be printed, since it is equipped with a double extruder.